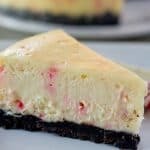 Creamy white chocolate cheesecake swirled with peppermint bits and with a rich chocolate mint crust. Perfect for the holidays! Place 25 Mint Oreo Thins in a food processor. (If using regular Oreos, instead of thins, scrape filling out of half of the Oreos and discard.) Run food processor until cookies break into fine crumbs. Add cookie crumbs and melted butter to a bowl. Stir to combine. Pour crumb mixture into 7″x 3″ push pan or springform pan. Using fingertips, press down crumbs, smoothing into an even layer. Then place pan in freezer while preparing batter. Add cream cheese, sugar, and cornstarch to a medium bowl. Beat until smooth. In a microwave safe bowl, combine white chocolate chips and heavy cream. Microwave chips and heavy cream for 25 seconds, then whisk until completely smooth. If chips are not melted after one minute of whisking, microwave for 10 second intervals, stirring in between, until smooth. Let white chocolate mixture cool until warm, not hot, then fold into cream cheese mixture until completely combined. Add eggs and vanilla and beat until just combined. Place 1 or 2 candy canes in clean food processor and process until crushed. You can also buy candy cane bits to use instead. Remove cheesecake crust from freezer and pour batter into pan. Add 1 1/2 cups water and 3-inch trivet to Instant Pot. Cover cheesecake with foil, and place on trivet. Cook for 40 minutes at high pressure, then allow a natural pressure release. Once pressure is released, turn off Instant Pot and carefully remove cheesecake. Remove foil and allow cheesecake to cool for one hour or until room temperature. Once cool, carefully run a paring knife around the edge of the cheesecake to separate from pan. Refrigerate for at least 6 hours, preferably overnight. Carefully push cheesecake up from push pan by placing center of push pan on a can or glass and pushing edges down. If using springform pan, gently remove outer edge of pan. Then serve and enjoy. Oreo thins can be replaced by 25 regular mint Oreos with filling removed from half. If you cannot find mint Oreos, regular Oreos will work.